Being adopted is a weird sort of internal reality that is always with you. I can report this to be true from about 50 years of my own life experience. Yes, it was about 50 years ago at this exact time of year that I was told by what I knew as my parents, that they were actually NOT my birth parents at all. THAT.WAS.WEIRD! I had never once considered that there was any other circumstance. The news hit me like a brick! I went into an immediate meltdown emotionally. This lasted, as I recall it, for about 60 seconds at the most. That is about how long it took for me to realize that, wow, what I had in reality – versus what could have been my reality – was a pretty sweet deal. As I write this, I saw just today a picture someone had posted on Facebook. It was of a man who had written his date and location of birth, stating that he was searching for his birth parents – asking also for others to re-post his picture in hopes of locating his lost family. My heart went out to him. I knew about my birth parents – know one of them personally, as she is still alive. And I miraculously learned information about my father just this past year – a totally amazing story of even meeting a lost relative. But spiritually speaking, there is no confusion about our past and where we have originated. We were by sin connected to the Kingdom of Darkness and enslaved to such. But in his love, the Lord has rescued us from that and brought us into a new kingdom – the Kingdom of Light – the Kingdom of His Son. The text today says that it is through the Son that we have REDEMPTION – the forgiveness of sin due to the payment that Jesus Christ has made. What a great cross word! My own adoption set up an inheritance powder-keg with a 51-year-long fuse before it exploded. A certain part of the biological family of my adopted parents had never accepted the fact that I had been adopted and thereby did not believe I stood in line to receive the inheritance of my parents upon their death. Their inquiry into this was an exercise in futility, as the legal ground of the adoption and will was indisputable … and so it is for us spiritually speaking, as we will see this even more graphically expounded tomorrow. Evil – the reality that Satan brought sin to mankind, and Satan worked in devious ways to attempt the destruction of Christ and his work on the cross. Veil – the curtain that separated the most holy place from the rest of the tabernacle/temple. 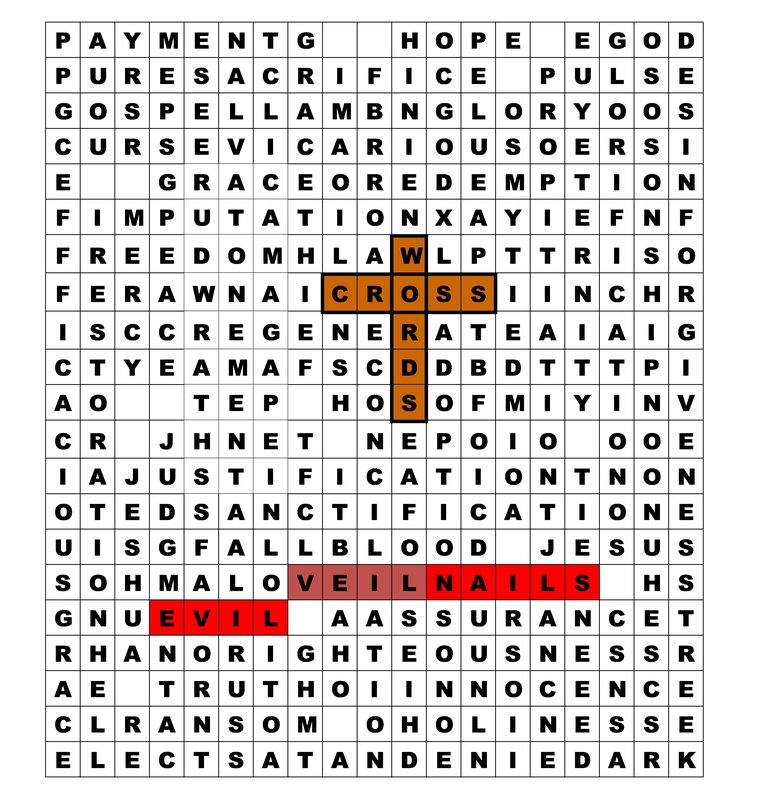 Nails – (think “spikes”) the human objects that held Christ to the cross – though it was really love and obedience.